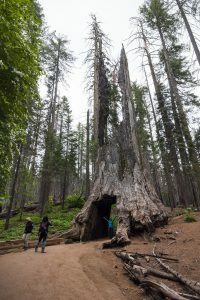 Hike down an old road to come up close and personal with about a dozen Giant Sequoias. Of the two Giant Sequoia groves in the Crane Flat area, this hike is a bit busier with a larger parking lot and the shorter of the two. It follows the Old Big Oak Flat Road on a steady grade down about 500ft/150m to the grove. After about 1mi/1.6km of walking, the first Sequoias, with their distinctive shape, are visible off to the left. Further down the road, explore the loops of trails through this stand of trees with interpretive signs. One tree has been cut to walk through, while another has fallen revealing its massive root system. Continue down the road for a short walk to the last of the sequoias before heading back. Trailhead: The obvious signed parking area is located on the west side of the Tioga Road just north of the Crane Flat junction.